Are you searching for healthy, low carb, grain free, sugar free, nut free, back to school snacks? For an easy, make ahead, healthy breakfast on the go for Mum, Dad AND the kids, you can’t go past our On The Go recipe! 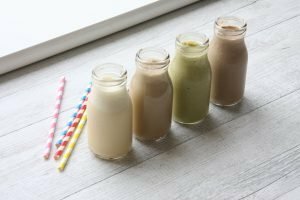 A much healthier alternative to store bought up and go alternatives, this recipe is packed full of healthy fat, loaded with protein and can be made dairy free using coconut or almond milk! They taste delicious when served cold, so make the day before and prep ahead – for the grown ups, our favourite is almond milk vanilla version, with a shot of coffee in the morning! For all the flavour variations you can can check them out in our Low Carb for Everyone cookbook. Get the ON THE GO recipe here! LE SNAX recipe has never before been freely released but it’s just TOO GOOD not to share with you. This Le Snax recipe is a make-at-home healthy version of a store bought product that is much healthier for our little ones (and great for adult snacks too!) Previously only available in Low Carb for Everyone cookbook we now want to share this brilliant recipe with as many people as we can! 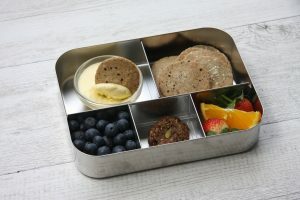 Seed crackers (make these nut free by subbing sunflower seeds for almonds) or Nut free seed crackers also make a great addition to kids` lunchboxes topped with ham, brie or cheddar and we have a few recipes to choose from that you can covert to nut free! If your child loves store bought crackers but you’r trying to be mindful about their carbs try The Low Carb Co seed crackers range, they are nut free and school compliant when you don’t have time to make your own. Mini Almond Pancakes go down a treat too – again just sub the almonds for sunflower seeds for nut free! 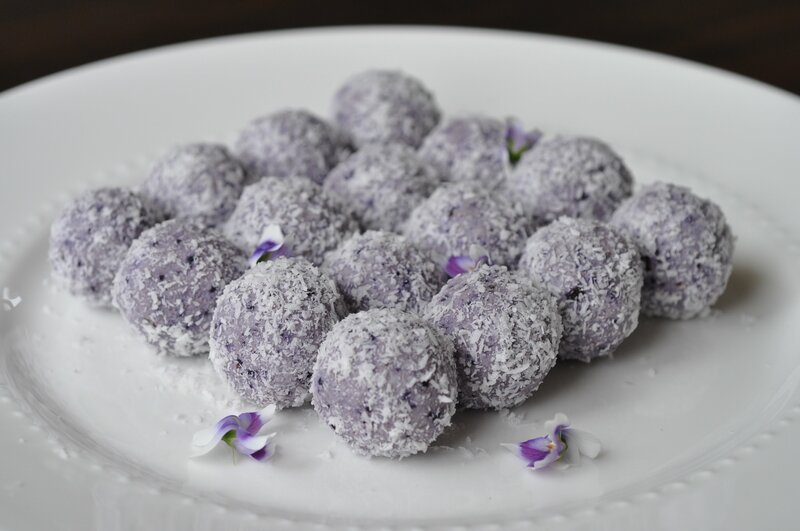 Make your child’s treats gluten free, nut free, sugar free & additive free with our our Blueberry Bliss Balls (make this ahead and pop them into lunchboxes straight from the freezer! ), they really are the perfect treat for your child’s lunchbox! Our pumpkin bread recipe is really versatile, and can be made subbing sunflower seeds instead of almonds and freezes well too! As well as egg rolls with ham and cheese, pitted olives, cherry tomatoes, fresh carrots, celery and cucumber sticks with cream cheese or french onion dip. Super dough pizza’s (from Getting Started cookbook) or take inspiration from our free super dough ebook with super dough or sausage rolls. I am sure your little one wouldn’t say no to greek natural yoghurt with frozen berries or vanilla or choc custard! If you do need more recipe inspiration, our cookbooks are Getting Started, Delicious Dinners, Low Carb for Everyone & Making it Simple – we have loads more recipes there, so check them out. If you already have the cookbooks but they’re collecting dust, brush them off and get re-inspired to cook from scratch for you and your family! Want to know or be reminded of just some of our most popular, lunchbox friendly recipes from each cookbook? Getting Started – Almond Pancakes, (these can be made nut free with sunflower seeds) and our Super Dough Pizzas or sausage rolls! Delicious Dinners – baby spinach & feta quiche & our green eggs and ham! Low Carb for Everyone – Choc fudge brownie, granola, 5 seed chocolate bars, our YoGoGo chocolate custard and our amazing, low carb wraps! Making it Simple – our famous vanilla cake, lemon tarts, soft bread rolls, cauliflower hummus & jam drop biscuits! All the recipes are super healthy – low carb, healthy fat / keto friendly, gluten free, grain free, sugar free and SERIOUSLY delicious! They are so easy to make with no fancy, hard to find ingredients! Now you’ve got all the tools your need to make the best food choices for you & your precious little ones! P.S We love the huge range of lunch boxes that Biome sell to make packing school lunchboxes easy! We have our eye on the new yumboxes! * We have an affiliate account with Biome, so purchasing a lunchbox via the above link, helps support what we do.